IT industry and infrastructure development have been providing a scaffolding to Bangalore’s realty market for more than a year. However, impact of the downtrodden economic scenario is finally visible. After witnessing a comparative quarter-on-quarter drop in the average capital values, Bangalore’s realty market is now plateauing. Experts believe that the city will witness further price correction in the next six months. While all the major cities in India recorded a steep fall in absorption of housing units, Bangalore witnessed the downfall at the slowest pace. Backed by infrastructural advancements and IT industry, the city continues to attract end-users. This was the first time in last three years when housing demand exceeded supply in the city. While this may hint at price appreciation in future, this seems to be a price corrective phase and may bring stability in the market. Until June 2015, Bangalore held over one lakh unsold housing units. As developers focussed on completing existing projects, number of new launches slacked by over 75 per cent year-on-year. 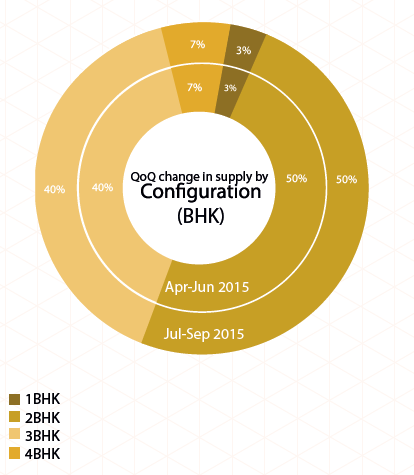 About 5000 new housing units were added to the market in Jul-Sep 2015. Realising the importance of advancement in infrastructure, the Bruhat Bengaluru Mahanagara Palike (BBMP) proposed to spend Rs 5,000 crore on infra development this year. To safeguard home buyers from unscrupulous realtors, the Karnataka Town and Country Planning Act (KTCPA), 1961, was amended. The revision disallows registration of properties until the project is completed as per the approved construction plan. To ease the property registration process, the Department of Stamps and Registration planned to bring all the sub-registrar offices in Bangalore under one umbrella. The city witnessed increased power outages as more power was disseminated to commercial and retail buildings. This hit the residential market barring areas near IT hubs. Frequent rains worsened the situation. All localities in East, except Marathahalli, Whitefield and Sarjapur, suffered a setback due to the power crisis. Concentration of job opportunities ensured that housing demand remained relatively robust in East and South Bangalore, especially from end-users. However, this did not impact property prices in the region. The current quarter saw capital values plateauing with nearly one-third of the tracked localities recording a drop in property values. The negative price movement in popular residential markets such as Whitefield, Marathahalli and Sarjapur Road can be attributed to factors such as incessant power cuts, non-availability of Kaveri water supply and excess housing inventory. Areas around Gunjur and Haralur Road recorded a spike in property prices owing to their planned inclusion in the Yellow Zone (mixed land use) as per Bangalore’s Comprehensive Development Plan (CDP). JP Nagar, Jayanagar, BTM layout and Banashankari from the South continued to grow on a linear scale due to seamless connectivity with the central and eastern parts of the city. The major arterial roads of the South, Kanakapura Road and Bannerghatta Road, continued to garner healthy housing demand owing to proposed connectivity by Namma Metro. Planned widening of the Bannerghatta Road also added to the investment prospects of the belts. Affordability and upcoming metro connectivity boosted property prices in Bommasandra and Hosa Road by one and five per cent, respectively. With more than 2,000 apartments under-construction, Akshaya Nagar recorded the highest dip in values (10 per cent) in Jul-Sep 2015. 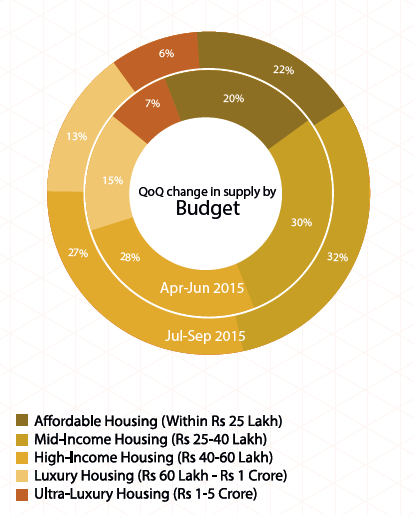 Most localities in East and South Bangalore saw a stable rental market in the quarter ending September 2015. Despite oversupply of housing units, rental values did not take a hit, leading to high vacancy levels in prime residential areas. According to experts, the job market was afflicted by low increments and job cuts, directly impacting demand for rental housing in the IT-driven zones. The worst hit was Electronic City, which also suffered due to excess inventory and infrastructure bottlenecks. Peripheral areas, especially those around the Outer Ring Road (ORR), continued to garner traction for rental accommodation. Connectivity and affordability have been the key stimulators for these localities, especially for areas such as HRBR Layout, Ramamurthy Nagar and Old Madras Road. While Whitefield is an established IT hub in the East, Koramangala from the South has evolved as the hub of start-ups in Bangalore. Both localities recorded stable rental values as robust housing demand balanced the unoccupied inventory. Premium areas such as Indira Nagar, JP Nagar and Jayanagar continued to be the most sought after housing destinations. Metro connectivity is one of the major catalysts driving housing demand to these areas. Traffic snarls and long-pending construction work impacted the rental values in Sarjapur Road, BTM Layout and Haralur Road. Developing industrial and investment zones in both North and West Bangalore have led to a shift in investor’s interest. More than half of the tracked localities recorded positive price movement in the current quarter. Overall, the three zones recorded an average capital appreciation of one per cent, signalling stability in property market. Housing demand along Bellary Road such as Devanahalli, Yelahanka New Town, Kodegahalli and Sahakara Nagar was driven by their proximity to the Kempegowda International Airport and the proposed Information Technology Investment Region (ITIR). The proposal to extend the Namma Metro up till the airport in its third phase attracted investors to the region. Majority of the housing demand in the North has been from high and mid-income segment home buyers, who prefer developing yet well-connected areas. Demand for affordable housing was particularly noted in areas along the Mysore Road in the West. Exclusion of Bidadi from the list of Smart Cities hurt realty investments across Mysore Road, which despite being connected by the metro, recorded a marginal dip in capital values. Investments in several localities such as Vidyaranyapura, Thanisandra and Nagavara suffered due to civic and physical infrastructure issues such as inept drainage system, roads with potholes and open manholes, and inefficient garbage disposal mechanism. 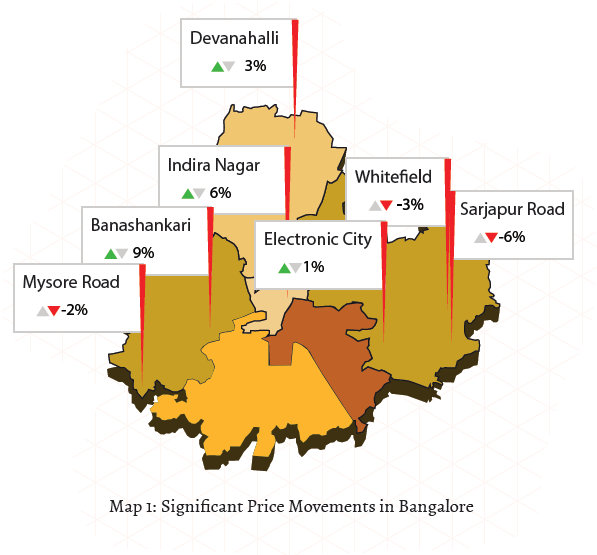 With housing demand shifting to peripheral areas, localities in Central Bangalore such as Cox Town and Fraser Town experienced price correction. Localities in North and West Bangalore continued to get healthy demand from both end-users and investors due to their proximity to the upcoming commercial and office complexes. Majority of the housing demand and thus, positive movement in the rental rates was noted in localities connected by Namma Metro. While Malleshwaram recorded a five per cent hike in the last six months, Yeshwanthpur witnessed stable rental values. 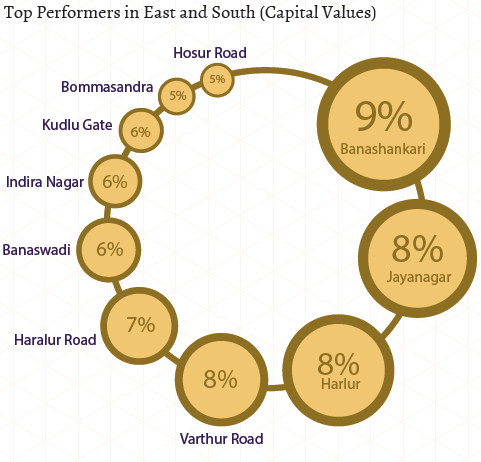 Kengeri, strategically located at the convergence of NICE Ring Road and Mysore Road, topped the list of best performers with 10 per cent appreciation in the last six months. 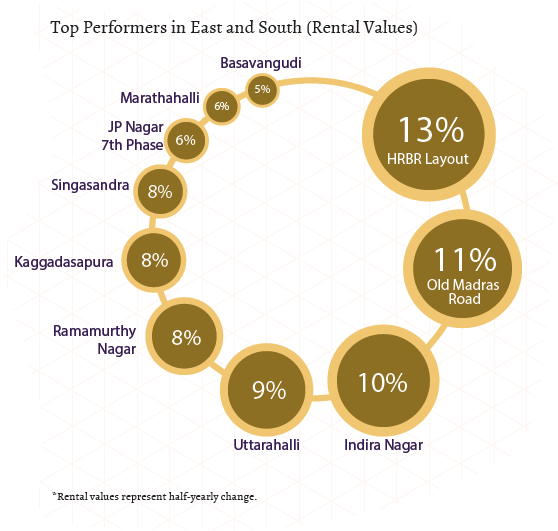 While affordability played a key role in boosting Kengeri’s rental market, its connectivity to West, North and South Bangalore ensured robust housing demand. Yelahanka, Hebbal and Malleshwaram in the North suit the workforce of Manyata Tech Park. All three locations recorded a hike in rental values to the tune of five to eight per cent. Housing demand in Yelahanka inched up due to availability of affordable housing options. Those preferring to stay in Central Bangalore chose economically viable options. Therefore, premium areas such as Lavelle Road lost a considerable share of tenants to nearby areas such as Ulsoor and Richmond Road, which offer options at competitive prices. Localities such as Hennur in North and Nagarbhavi in West suffered due to oversupply of housing units. Low occupancy rates impacted the rental rates adversely. 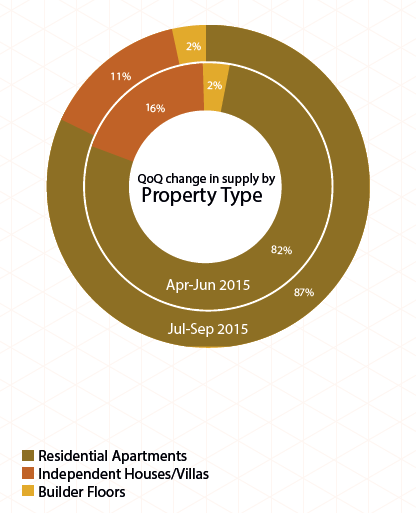 Rate of absorption of housing units continued to dip in Bangalore, resulting in stacked inventory. Ready-to-move-in units and mid-income segment properties were considered safe investments and hence, majority of the sales were reported in these two categories. Preference for low-priced housing options led to increased supply of residential apartments in Bangalore. The increasing power and water crisis for the last six months also led to a shift in demand to apartments from builder floors and independent houses/villas. While South and East Bangalore recorded the maximum availability of apartments, experts mooted that both the zones witnessed an oversupply. This resulted in majority of housing units lying vacant or unsold, thus impacting the overall capital growth. Supply of independent houses and villas dropped in South Bangalore due to perishing demand for premium properties. In the West, builder floors lost a major share of the market to society apartments. Experts opine that this could be due to the uninterrupted power and water supply that residential apartments offer. Amongst all zones, builder floors witnessed maximum availability in Central Bangalore. The units are popular amongst the high-net worth individuals (HNIs). As demand for premium properties dropped, developers’ focus shifted to affordable and mid-income housing units. South Bangalore continued to witness maximum availability of homes priced within Rs 40 lakh. Majority of the inventory falling under the mid-income housing segment (Rs 40-60 lakh) was concentrated in East and South Bangalore. According to experts, demand for affordable and mid-income housing segments surpassed supply and therefore, the rate of absorption of these units is much higher than properties falling in higher budget categories. The average capital value of affordable properties in Bangalore ranges between Rs 2,000 and Rs 3,000 per sq ft, whereas, a mid-income segment home is priced up to Rs 5,000 per sq ft.
Supply of inventory falling under the high-income housing segment (Rs 60 lakh–Rs 1 crore) continued to capture more than a quarter of the total market share. These units were predominantly available in the East, especially in Whitefield, Marathahalli, Sarjapur and Old Madras Road. Supply of luxury housing (Rs 1-2 crore) recorded a marginal dip in the quarter ending September 2015, as compared to the previous one. South Bangalore recorded less availability of these units, as compared to the previous quarter. There was an increased supply of builder floor units in Central Bangalore in the said budget. The ultra-luxury housing category (Rs 2-5 crore) witnessed maximum demand from Non-Resident Indians (NRIs), especially along the Bellary Road which leads to Kempegowda International Airport. Hence, availability of properties in the said budget was high in areas such as Yelahanka and Hebbal. The city-based HNIs preferred buying ultra-luxury properties in localities near the Central Business District (CBD). Thus, areas such as Frazer Town, Benson Town and Ulsoor recorded a healthy supply of homes priced between Rs 2-5 crore. Supply of various configurations – 1BHK, 2BHK, 3BHK and 4BHK – remained unchanged in Bangalore over the last six months. Properties configured as 2BHK continued to capture half of the total market share. Most of the 2BHK units in the city were available as residential apartments priced within Rs 40-60 lakh (mid-income housing). Experts opined that properties priced within Rs 40-60 lakh are the most easily absorbed units in Bangalore. Majority of the takers for these homes are young professionals with nuclear families. Homes configured as 3BHK units are the next most supplied in Bangalore. About a tenth of the share of these units are available as independent houses and villas priced between Rs 60 lakh and Rs 2 crore, depending on the location of the property. Residential apartments configured as 3BHK units are priced a notch lower. While majority of them are available within Rs 60 lakh-Rs 1 crore, a considerable supply is within Rs 40- 60 lakh as well. 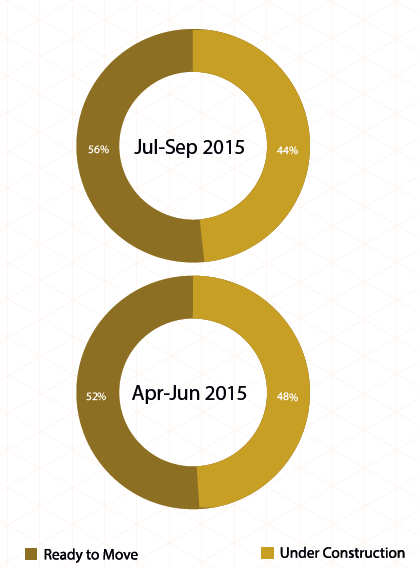 Bangalore surpassed all major cities in terms of new launches since January 2015. However, the pace of new project launches has been severely hit due to low absorption rates. While developers focussed on completing ongoing projects, under-construction properties outnumbered ready-to-move-in residential inventory in the city. Buyers preferred ready-to-move-in properties over under-construction homes, leading to the latter getting stacked at a higher rate. Persistent delays in construction schedules and uncertainty about the final outcome of a project forced buyers to focus on safer investment options. In line with demand, mid-income housing was the most constructed in the city, closely followed by the affordable housing segment.